Cuando su crucero atraca en Falmouth, pase el día explorando 2 de las cascadas más famosas de Jamaica. Durante este recorrido que incluye visitas al Agujero Azul y las Cataratas del río Dunn, decida qué característica del agua es más impresionante. Pruebe las aguas azules de otro mundo en el remoto Agujero Azul y suba a la cima de las Cataratas del río Dunn de 600 pies (182 metros). Se incluye transporte de ida y vuelta desde el puerto de cruceros de Falmouth. Suba a la cima de las cataratas del río Dunn para disfrutar de espectaculares vistas de los alrededores. Se incluye transporte de ida y vuelta desde el puerto de cruceros de Falmouth. This was definitely a fantastic experience. Clyde our tour guide made the trip fun and informative recommending places to eat lunch and shop for authentic souvenirs. Dunn falls is a must see even though it is highly commercialized its sheer natural beauty still stands out and its quite an adventure climbing up those rocks. Blue Hole is extremely less commercialized and just as beautiful with much more fun activities such as rope to swing from and caves behind the waterfalls. Highly recommend this tour! We had a great time with an awesome guide. Very cold water and some swimming but clearly beautiful and exciting. Loved it. 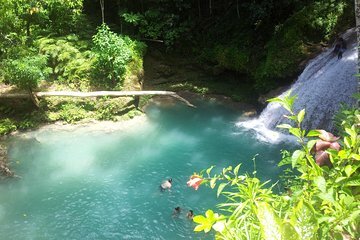 Our trip to the Blue Hole and Dunn's River was simply amazing. Our driver KJ was courteous, friendly and very knowledgeable about Jamaica and its rich culture. While at the beautiful Blue Hole, Jamar took my family on an adventure through the rainforest until we reached the phenomenal cliffs that we were able to jump off of into the refreshing water below. Our experience at the Blue Hole was like no other! Following we visited Dunn's River Falls which was nice but a lot more commercialized and crowded. Definitely worth seeing but once is probably enough. Following our adventures we grabbed lunch at Scothchies for some amazing jerk chicken and pork. The day in Jamaica was a wonderful and memorable experience thanks to the local touch of both KJ and Jamar. When we return, we will definitely revisit the Blue Hole where we hope to see Jamar again and its our hope that KJ can drive us there! I cannot say enough positive things about those two and our experience in Jamaica! When I booked this tour, I fully expected to be in a van with a few other people, which I figured was still better than the cruise ship busses. We ended up with a private driver and a great day! Navar met us in the private tour area and called us by name immediately so there was no anxiety about whether we were in the right place. We got on the road and had a great conversation about the places we were passing as we drove. On the way to Dunn's River Falls, we stopped a couple of places for pictures and had a quick tour of some artifacts in a roadside museum. Both stops were a little unexpected and obviously pre-arranged between our driver and the folks selling their wares at each place but were worth the time and we would never have had those experiences if we had been crammed on a cruise ship bus. I was glad to have had a few small bills to thank our tour guide at the museum. When we got to the Falls, Navar gave us advice about going up with or without a guide and about how to pass through the vendors at the exit and sent us on our way. We opted to climb the Falls without a guide and that was a good choice for us. We were given the occasional helping hand in trickier spots but for the most part could climb without waiting for a big group. The first section is the most daunting and once I got up that part I could relax and enjoy. We had water shoes and swim suits but there were people climbing in all kinds of attire. I even watched one woman climb with an everyday purse over her shoulder! It got soaked. We got through most of the Falls and decided we'd done what we wanted to do so we headed out. Navar's advice to keep walking and not engage was good and we got through the dozens and dozens of vendors without too much issue. It's definitely high-pressure but because there's always someone behind you, the vendors don't spend too much time with anyone who doesn't respond. We prepared our daughter by telling her that while it might seem rude, we just needed to keep walking. Climbing the Falls was a great experience and I'm so glad we did it! When we were done at Dunn's River Falls, Navar was waiting in the parking lot and we were off to Blue Hole. Again, we learned a lot about the countryside and the culture as we made the drive. When we got to Blue Hole, we were taken right to a guide without the option to do it on our own. That turned out to be a really good thing. I thought the Falls would be our adventure for the day and that Blue Hole would be a more relaxing tour. Blue Hole turned out to be just as much excitement - and effort. We climbed rocks and jumped off platforms, all with Odean's help to navigate and steady us in the tricky places. While it wasn't what I expected swimming around in a serene pool, it was amazing. With the right expectation, it's a blast. There was a little miscommunication between Viator and the contracted tour company. The price we paid was supposed to cover our admission to both places and our driver was only expecting two adults so he was only planning to pay our admissions. I showed him our confirmation which included our daughter and he was able to sort it out while we were climbing the Falls. It was a very small glitch in an otherwise great day. While it wasn't what I expected, it turned out to be even better. We had no issues getting back to the ship on time, despite the distances we traveled from Falmouth, and I have no doubt we had experiences no one else had. Great Trip! Our driver was great. Loved the falls - you don't need to get a guide unless you have some one in your group who needs physical help. The Blue hole was amazing! Definitely go with a guide as they will show you where to step, jump and what is safe. Earl picked us up at the port and took us on an amazing trip. We were the only booking, so we basically had a private tour. We first went to the Blue Hole, then onto the Dunn's Falls. At the Blue Hole, Earl arranged a guide for the adventure. Our guide was great. We did all of the jumps and the ripe swing. We went to the Dunn's Falls and skipped the Guide Station, per Earl's recommendation. It was much quicker and we could choose our path. Earl tried to take us to Scotchies for lunch, but it was way too crowded, so he took us to another Jerk Chicken place. It was delicious. After lunch, we were tired and asked to go back to the port. A very wonderful day. My kids 12 and 15 consider this one of the best adventures of their lives! Pick up was easy. Ryan was waiting for us, and we went straight to his van. On the way to Blue Hole, he explained a lot about Jamaica, engaging the kids they are shy, so that was a big deal for them, and basically keeping us interested the whole way. Blue Hole was a challenge! From climbing up, to rappelling, and jumping down way down, it was a non stop adventure. Alex was our guide at Blue Hole, and he took great care of us. Hands ready to help us across, up and over the rocks, and kind words to help nudge this timid mom to jump. And I did every last bit of it. My kids wish we could do it again. Then on to Dunn's River. We chose not to use a guide, and it was the right choice for us. We got caught between 2 large groups in the beginning, and grew very frustrated. Once we figured out how to shake loose of them, it was adventure part 2. My son led the way, and proved that he is part lizard, part mountain goat. I was often left wondering just how I would get to the next level. But that was the best part of not having a guide. We got to go at our own pace, and could sit for a minute, watch others, look down at how far we had come, and then move on at our speed. The market on the way out is tough. The people are very aggressive. Just don't make eye contact, say no thank you, and keep moving. After Dunn's River, we went to Scotchies for lunch. The best jerk chicken EVER! We loved it! All in all, this was an amazing day, and I am very thankful to Brian and Alex for being amazing guides. I would do this trip again in a heartbeat. Just need to remember the GoPro! This trip was amazing! We had a private tour to Blue Hole and Dunn's River falls. Our driver, Brian, was excellent. He explained things all along the way. We asked him to take us to craft markets that the locals would get the money instead of the ports. The guides at Blue Hole took very good care of us and made sure we enjoyed the experience. Dunn's River is very crowded but still worth the trip. I will be booking with Viator again. Blue Hole was nice but I thought we would be on our own. But we had to get a guide who kept demanding a tip of 20. And the end he asked for more money because he took lots of photos of us. Dunn's Falls was nice because it was a lot less crowded when we went there after Blue Hole in the afternoon.